The UTK0197 Wilderness Knife was developed to test how well a large knife would perform when the Wilderness Knife line standard width of 0.210” is configured into a blade of 8 inches. 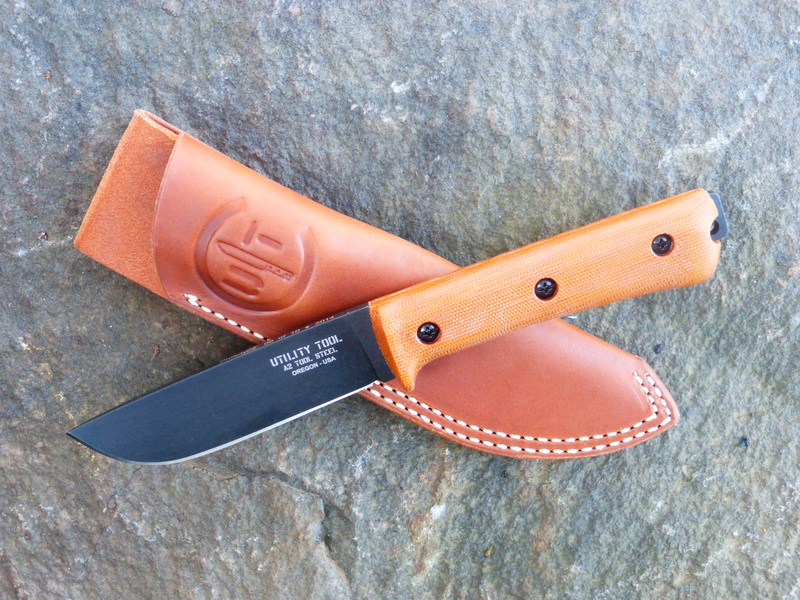 The goal was to create an all-purpose tool within the design parameters of the Wilderness Knife line. 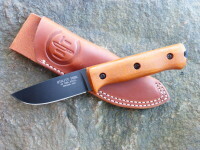 The blade shape and contours are proportionally (80%) the same as the UTK0255 10” Blade Field Knife. The result is a fairly light (at 13.4 ounces) tool with considerable capabilities. 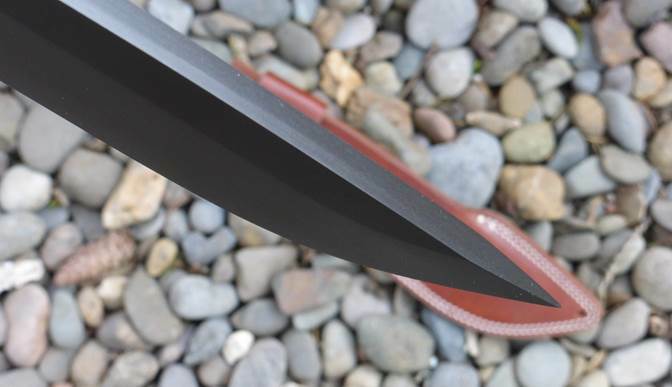 Due to the blade profile and grind the weight is well forward, with a balance point approximately 1.5” forward of the guard. 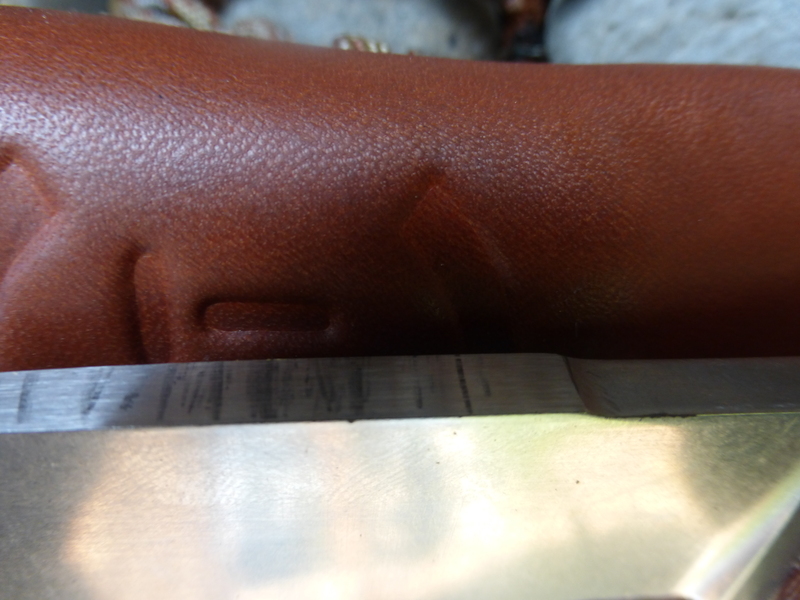 As a result of the shift in balance forward and the additional weight all the handle profiles were tried and surprisingly the Number 5 (see the pictures) seemed to provide the most control. 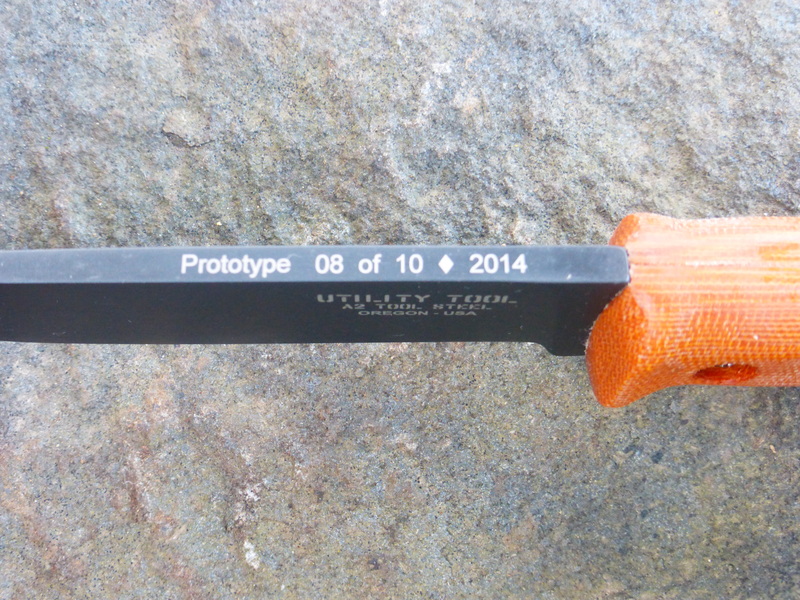 Time will tell if a new handle will need to be designed to fully capture all the potential of this tool. If you read this and have any ideas about what handle type would work best, let us know your ideas. 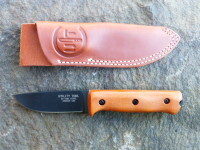 UTK0197 8” blade Wilderness Knife prototype with modified Spec Ops Brand standard modular sheath in coyote brown. The handle is a Number 5 profile in natural micarta. 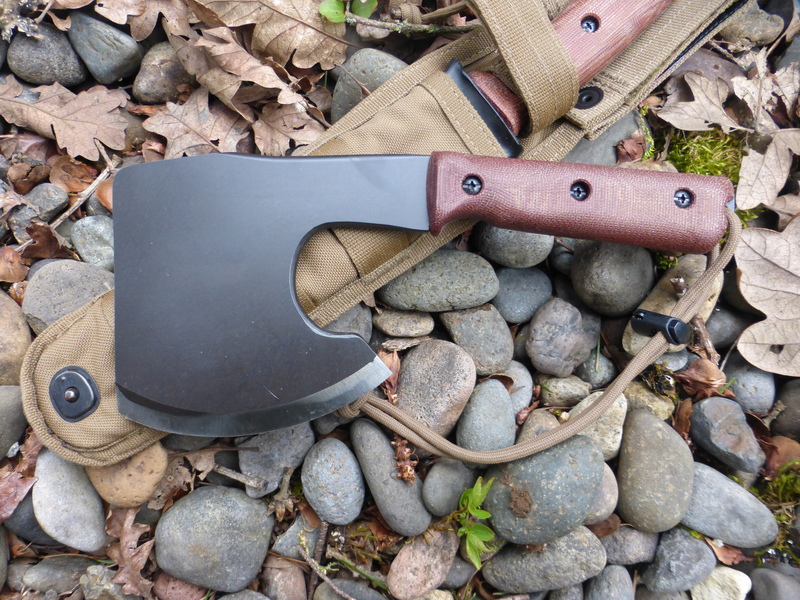 Blade shows some initial use as a prototype it will see more time in the woods before the production model is built. 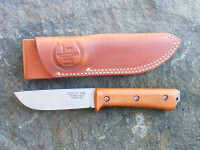 K0197 8” blade Wilderness Knife prototype shown with the UTK0255 10” blade Field Knife. 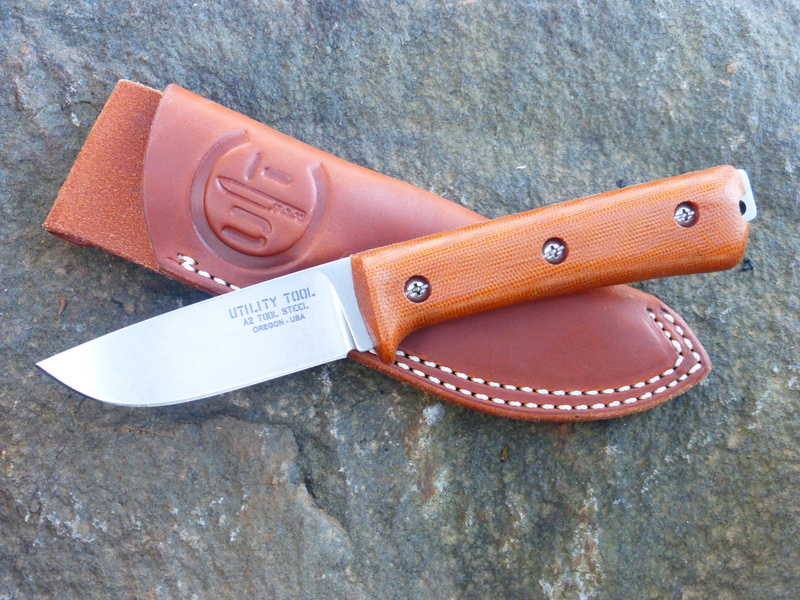 The UTK0197 is an approximate 80% scale model (dimensionally) of the larger tool. 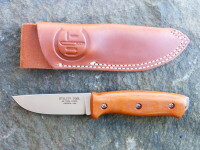 UTK0197 8” blade Wilderness Knife prototype shown with the UTK0255 10” blade Field Knife (top) and a well-used example of one of the original UTK0151 6” blade Wilderness Knives that have proven to be very popular. UTK0197 8” blade Wilderness Knife prototype shown with a UTT010X Woods Tool prototype (top). 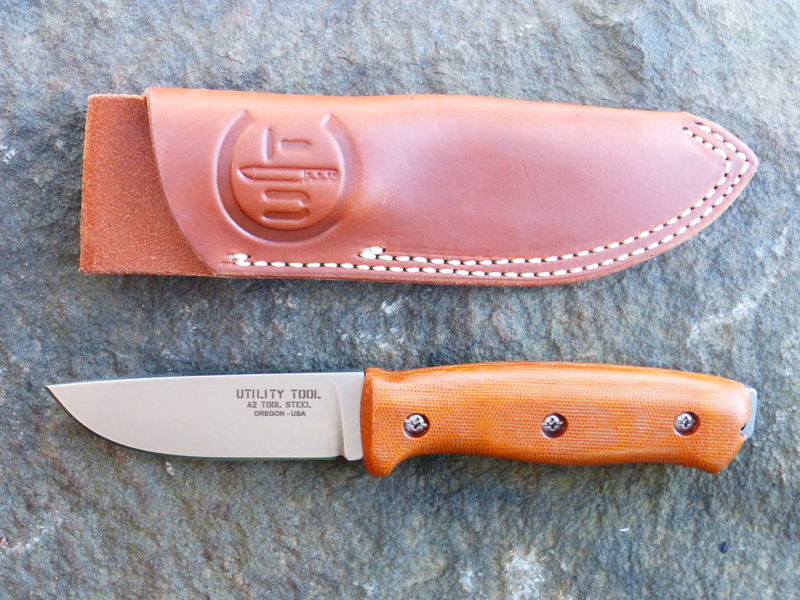 UTT010X Woods Tool prototype with a Number 4 profile handle in natural micarta. 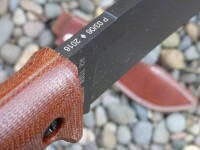 Note the large radius that creates the beard on the tools blade and that the edges that potentially could come into contact with the users hand are radiused. 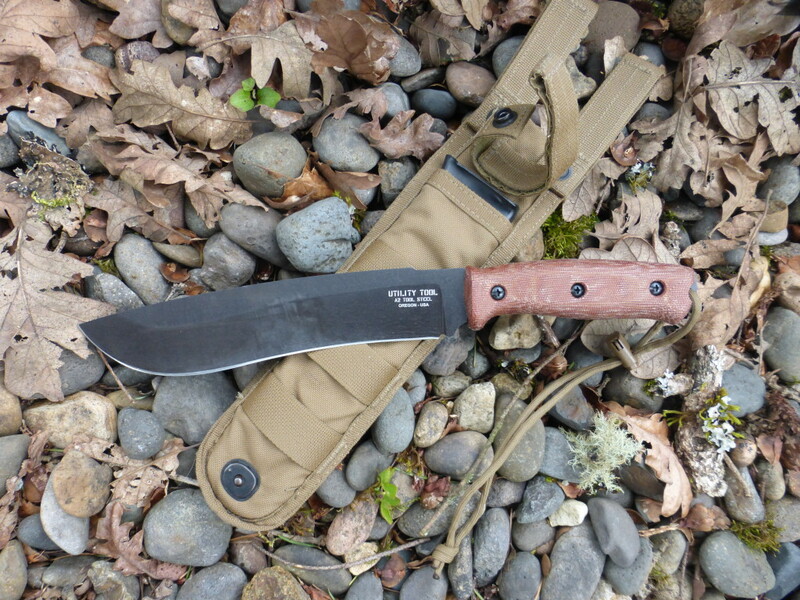 There have been requests for a larger and longer version of the UTK0200 8” Field Knife a model which made its market debut in CPM S30V Stainless Steel 4 years ago. As with most things, there is a story, but before we go too far let’s backup a bit and cover some background and history. 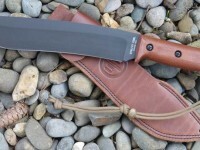 In the process of making the first UTK0200 a few 10” Field Knife prototypes were also made. 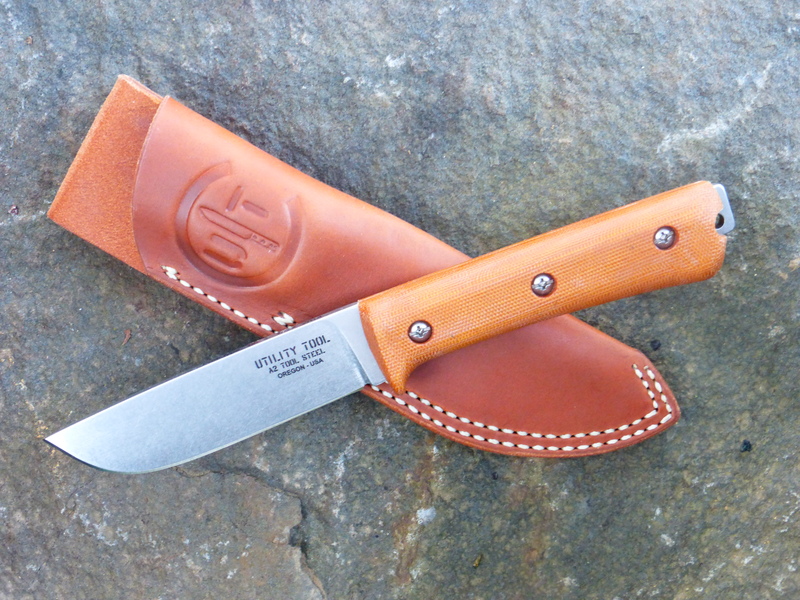 In profile the 10” prototype tool was similar to the ’Rifleman Knives’ made for, and issued by, the US Army after the war with Mexico in the mid-1840’s. 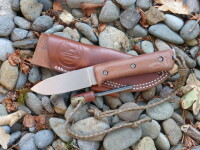 The example Rifleman’s Knife pictured here had an 11 7/8” long spear point blade. 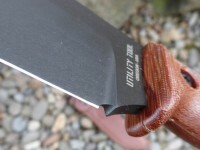 The first prototype UTK0255 was in reality simply an extension of the 8” blade to 10”. The first few were hand ground by Alan Warren and followed the pattern established for the 8” Field Knife. Unfortunately this tool, for the most part, did not perform up to expectations trials. Why? 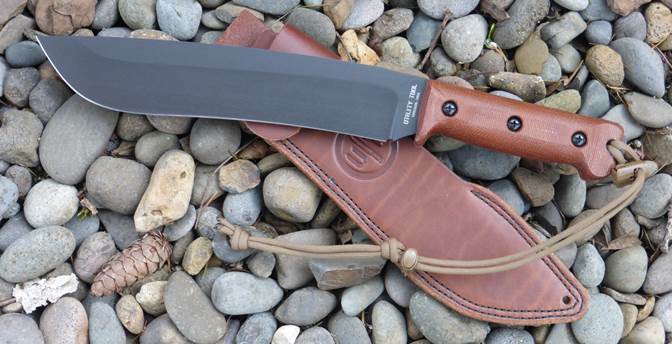 The original 10” blade lacked sufficient chopping ability but cut adequately across a spectrum of potential field situations. The balance was wrong, the swedge compromised the ability to baton, and it didn’t handle all that well in the hand. A few of these where broken in the process of testing them. The effort was not a total loss as we learned what it was that we did not want and discovered that this initial design as a field tool left much to be desired. 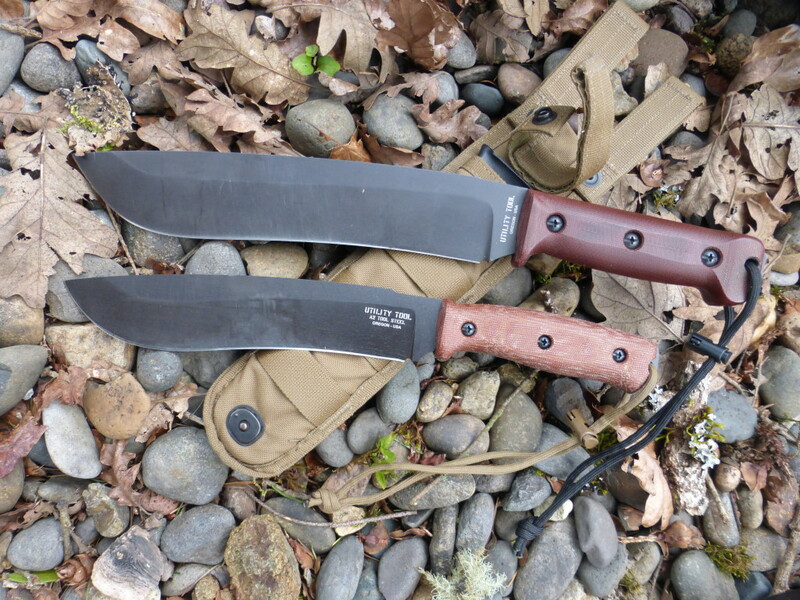 Those 10” prototypes were set aside at the time while we were busy making the Wilderness Knife line and exploring a set of smaller knives made out of D2 as well as a ‘Wilderness Folder’. Now that we have the history, let’s continue on with the story. With the recent batch of A2 Tool Steel UTK0200s we decided to review the original 10” Field Knife concept and see what could be done to make it a better tool. 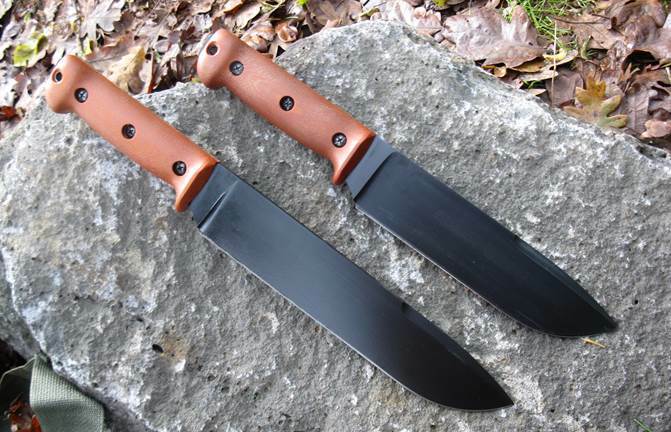 The first thing we changed was the material, instead of the original 1095 high carbon steel we decided to go with Crucible A2 Tool Steel and incorporate the 0.250” blade thickness and the most recent tang design used on all the carbon steel UTK Field Knives. These changes made being made, we moved next to the blade profile and design. 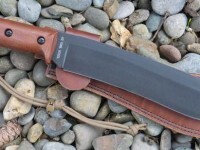 A good friend of mine had purchased a Pilipino Barong years ago while undergoing SERE (Survival, Evasion, Resistance, Escape) training and showed it to me as we discussed the larger knife. The blade on his example was 11.75” long, approximately 3/16” thick, had a tapered tang and was fabricated from what we surmise was a truck leaf spring (see picture below). 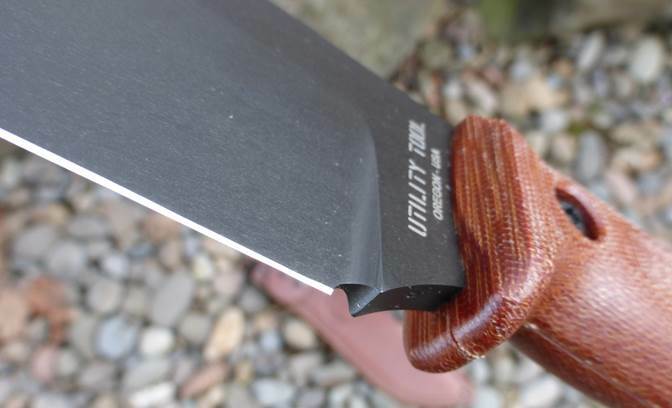 Crude by most any standard, it had the most interesting profile – a gentle slope on the spine towards the tip and an edge that followed a curve to provide additional weight forward without being tip heavy and unwieldy. 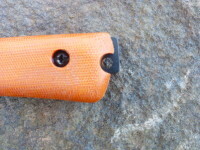 This was a working tool, made with the available material and designed for flexibility. 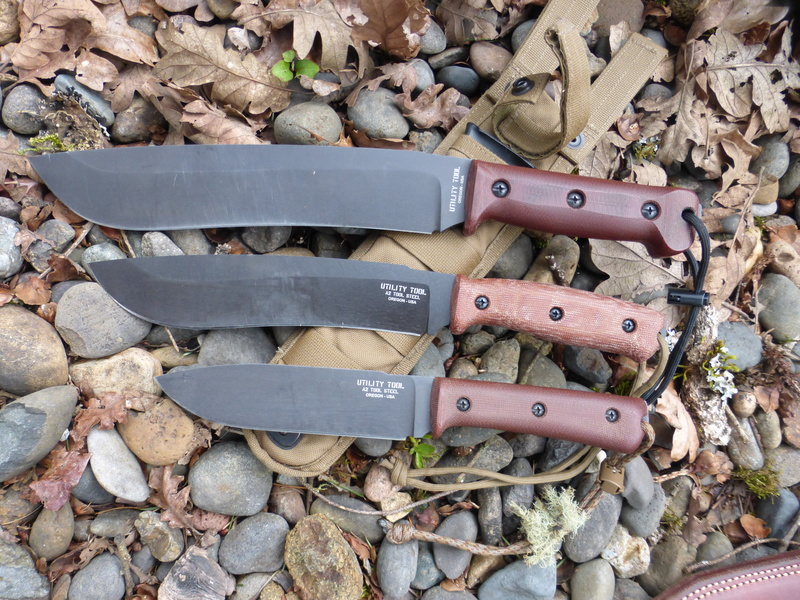 Working backwards from the barong design and keeping in mind how the last prototype had not met expectations we started to look at other multi-use tools to include kukri, large bowies, and various bolos (1904, M1917 and WWII Corpsman models) and smaller machetes. 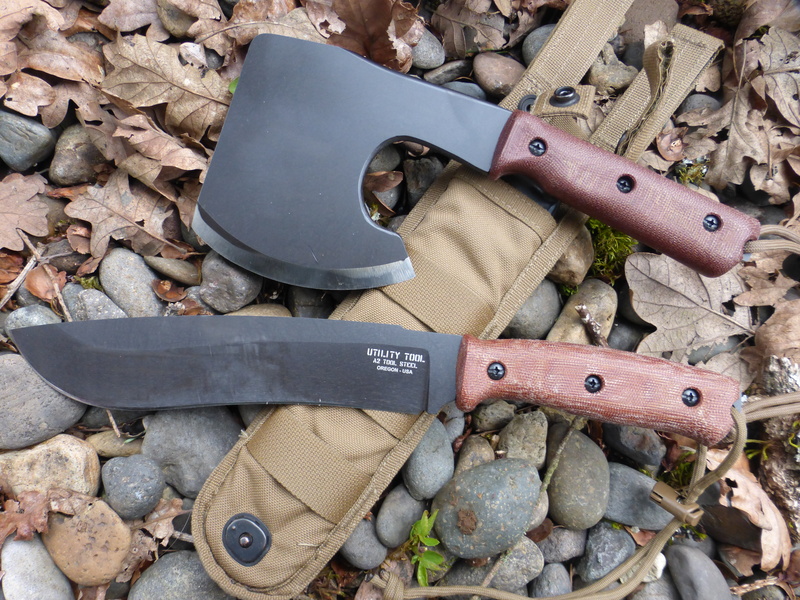 While looking at a variety of designs we were always kept in mind that we wanted the 10” Field Knife to possess sufficient heft to replace a hatchet in the inventory of field tools. The resulting design is shown below, both as an initial prototype and in pre-productions form. 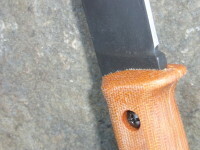 As you can see, the spine on the 10” blade drops forward approximately 1.125” at the tip. 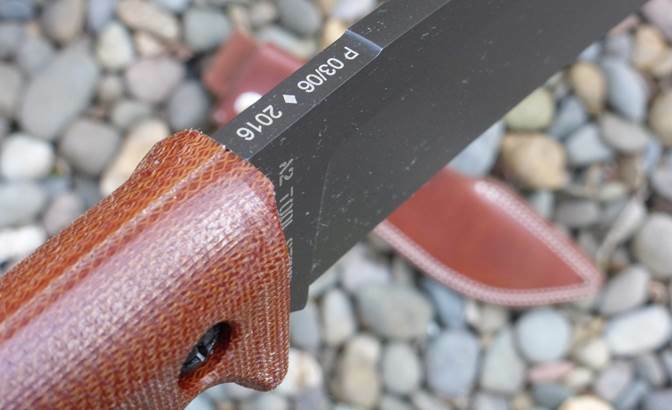 As well, the edge profile follows the increased blade depth and curves forward allowing the spine width of 0.250” to expand its depth towards the tip. 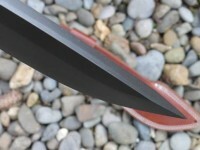 The result is a balance point ~1.70” in front of the guard, this one feels much better in the hand than the original. 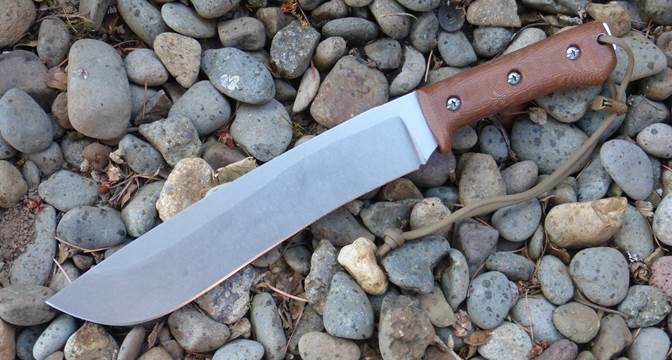 Chopping with this tool is much easier than with the first 10” prototype with its straight blade and swedge grind. 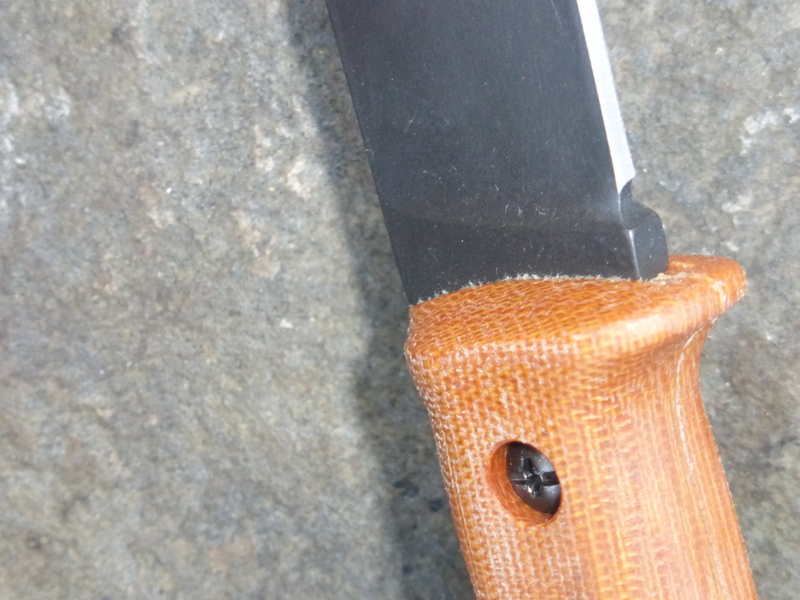 With the weight forward and the extended edge radius the cutting ability of this tool was much improved. 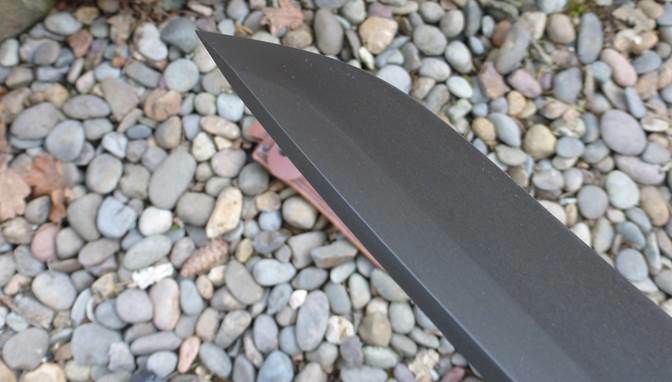 As well, the increased flat grind angle allows for an enhanced splitting action when used with a baton. 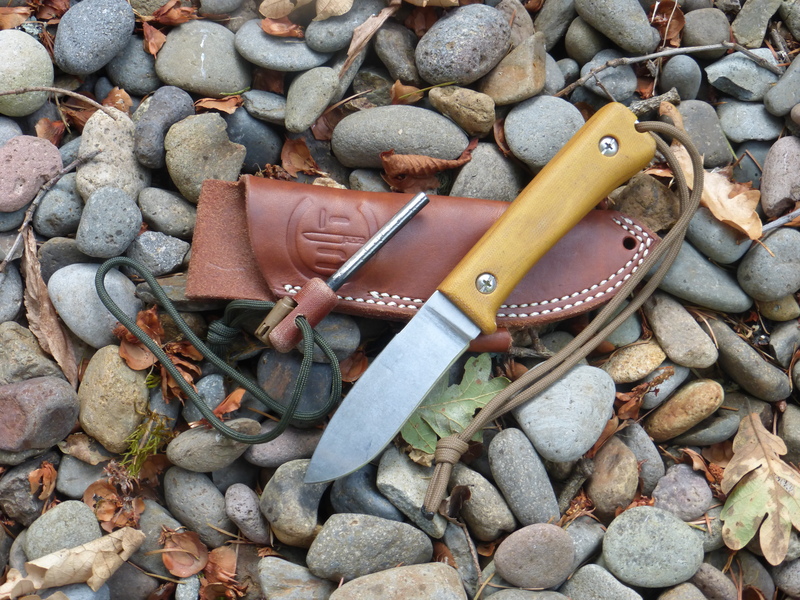 In trials we used the new design on the oak that is common in the Willamette Valley and on fir found locally in the Cascade Mountains to the east. It made short work of both types of wood. The cutting action was much improved over the old design. 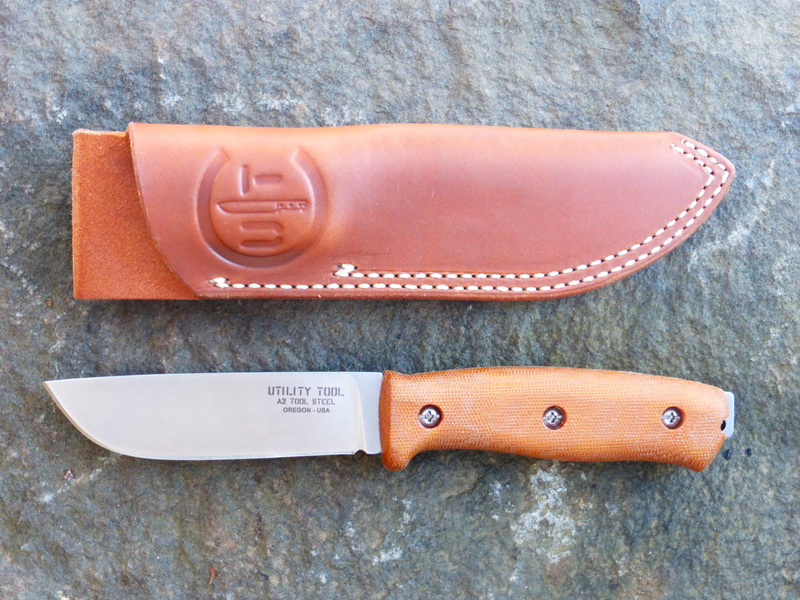 The first of two prototypes made in the spring of 2015 is shown above in stonewashed finish. 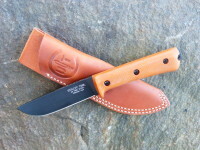 This particular blade was used extensively in the coast range in the fall and winter of 2015-2016 and in the Cascades in the late winter of 2016. This tool was eventually reground and black oxide coated and used further to see how the black oxide would hold up to chopping and batoning with the intension to use it as a sample. 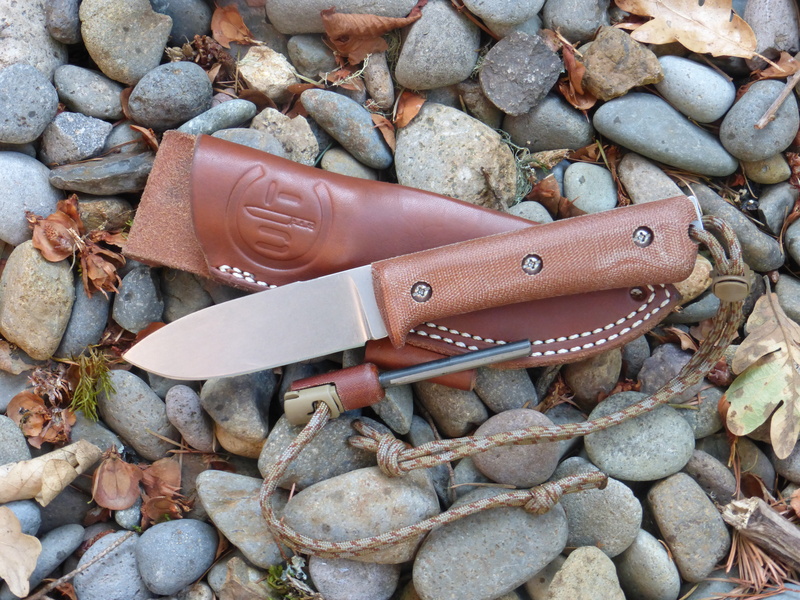 After using it for a short time it was sold at the 2016 Oregon Knife Collectors Association show to a repeat customer who wanted it more than we did! 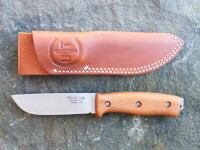 The pre-product version show below with the AE Nelson sheath is the result of the lessons learned after using the initial stonewashed prototype (above) above for a few months. 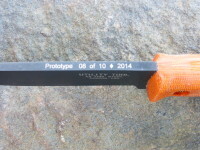 The tool pictured below (serial number 03 of 06) weighs in at ~20.0 ounces. 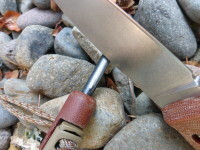 At that weight it seems to be border line as a belt carry tool. To address this our current plan is to offer an optional ‘Baldric Rig’ style shoulder strap from AE Nelson Leather Company (same folks that made our leather sheaths) to make it easier to carry in the field – the design of this accessory is forthcoming. Please enjoy looking at the pictures and let us know your thoughts. 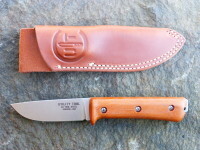 This is the prototype UTK0097 3.8” blade Wilderness Knife. 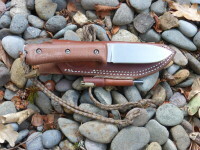 Based upon input from a few Utility Tool users, the UTK0097 became a spear point blade style knife with a unique “KS” edge (named after Keith and Steve – who gave me the idea) on the spine. 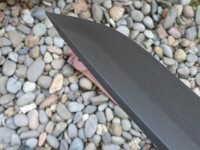 The KS Edge starts about one inch in front of the guard and continues on to the tip of the blade. 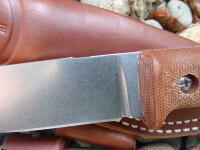 The edge can be used to scrape materials when making tools or can be used with the Hand-Fire Tool (HFT) to start fires. The KS edge worked so well in my blade trials that it will be standard on all Utility Tool Wilderness Knives from now on regardless of size or finish (Black Oxide or Stonewashed). When a Wilderness Knife is added with the HFT and the HFT loop equipped sheath it turns out to be both convenient to use and easy to carry. 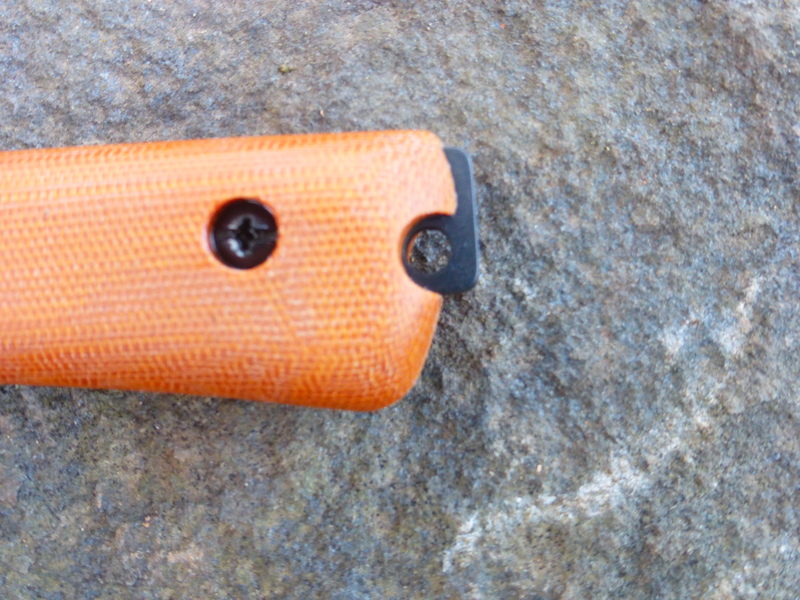 The HFT is made for use with loop equipped sheaths and with the built in cord-lock and lanyard can be secured to the sheath loop (or belt, or back pack strap) to prevent falling out or getting lost (see the pictures for how it works). What makes a knife a UTILITY Tool knife?